It's a good idea to take a full backup of your system including personal files and folders before upgrading. Read our tutorial on backing up your system. 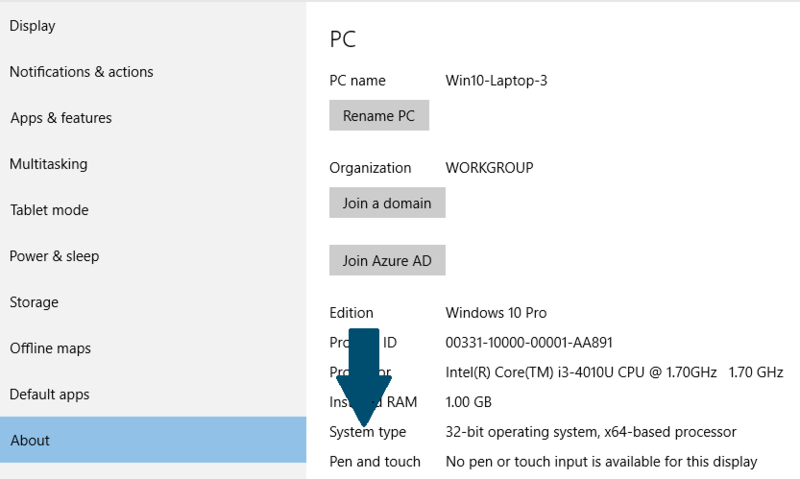 The 64-bit version of Windows 10 can only be installed if your computer's hardware supports it. You can verify that using the following four steps. Step 1: Press Windows key + I from keyboard. Step 3: Click on About. Step 4: Check the system type, if it says: 32-bit operating system, x64-based processor then your PC is running a 32-bit version of Windows 10 on a 64-bit processor. If it says 32-bit operating system, x86-based processor , then your computer doesn't support Windows 10 64-bit version. Step 1: Connect a USB drive to your system, the USB media must have at least 4 GB free space. Step 2: Visit Microsoft's Windows 10 download page. Step 3: Download the Media Creation Tool by clicking the Download tool now button. Step 4: Run the MediaCreationTool.exe. Step 5: Accept the license terms. Step 6: Choose to Create an installation media for another PC. Step 8: Uncheck Use the recommended options for this PC. Step 9: Make sure to select 64-bit architecture (x64). Step 11: Choose the USB flash drive option. Step 13: Select the removable drive from the list. Step 1: Restart your PC with the USB drive connected to the system and start the installation of Windows 10. Step 3: Click Install Now. Step 4: Skip entering the product key. Step 6: Click Custom: Install Windows only (advanced). Step 7: Select and delete system partitions -- usually: Drive 0 Partition 1 and Drive 0 Partition 2. Step 8: Click Next and follow the instructions to install Windows 10. After the installation is finished, download the latest updates and drivers from Windows updates. Should the windows installation come up straight away when I load my pc up? Your system must have a 64Bit processor (x86_64) to run a 64Bit OS, so you can’t upgrade to 64Bit Windows when your CPU is not capable of running the target OS. i followed everything step by step and i made sure that my PC to capable to run the 64 bit, but it says “This app cant run on your pc” PLEASE HELP !!!! Can I choose not to have my files erased? I just restarted my PC with the USB still in after I selected “Finish” on the Installation Media and when it restarted, there was no pop-up for reinstalling Windows or whatever it was. I checked in my Settings and it says that I am running 32-bit Windows and that I have a x64-based processor. Please help. My most pressing concern is whether or not I will have to purchase a new license for the 64 Bit Installation. Can anyone tell me? I lost my product key and now I have to buy a new one for windows 10 pro at $99. Please is there any way i can get my old product key. all the data will be erased or will be there.? wtf is this are you still responding to the questions?? if yes why do when i select to keep my files it says to restart my computer and lauch the setup from windows and when i do that it says this app cant run on your pc… HELP?!?!?!? I want to upgrade my laptop to windows 10 pro 64 bit from windows 10 32 bit. The process on faqforge is too cumbersome or tedious. I need to run matlab which is now 64 bit only and I am unable to run it on my 32 bit windows 10 pro. For this reason I need to switch to 64 bit windows 10 and the process is very very tedious. I want to do this switching without any formatting or data loss or partition deletion. Is there any way possible? this is a download for Windows Imging Component, not for windows 10 64 bit……..Nice try though…. This is not a way to upgrade from 32 bit to 64 bit. This is a way to install a 64 bit from an erased disk. Upgrade mean keeping data from one to other.